BAR HARBOR — State Rep. Brian Hubbell (right) was among the state and national officials who attended a Nov. 2 workshop at the MDI Biological Laboratory in Bar Harbor for scientist-mentors involved in an innovative new data-to-action citizen science program led by the laboratory. Also attending was Christopher W. Rector, a regional representative for U.S. Sen. Angus King and Willie Ellis of King’s Washington office. 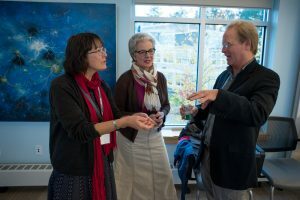 Here, Hubbell speaks with Program Director Jane E. Disney, Ph.D. (left), director of education at the MDI Biological Laboratory, and Paige Collins of Mount Desert Island High School, who will provide training for the program’s scientific mentors on working with teachers. The goal of the National Institutes of Health-funded Science Education Partnership Award (SEPA) program is to establish a national learning model for secondary school education in data literacy while addressing a major regional public health problem: the contamination of well water with arsenic. Long-term exposure to arsenic can lead to serious health problems. The high school students and teachers involved in the program will work with scientist mentors on improving data literacy skills using data on arsenic and other contaminants collected from local well water samples.